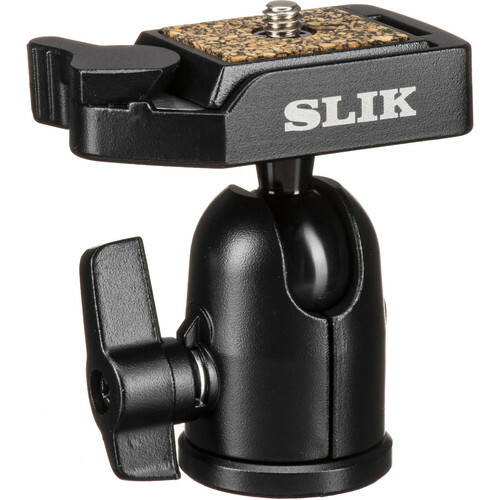 The Slik SBH-100 DQ Compact Ballhead 100 with Quick Release is a compact and lightweight ballhead that is ideal for any point-and-shoot digital or film camera, a bridge camera, or a lightweight SLR system. The head features an easy to use single-lever release that locks the camera into place with one single action. In addition, it also features a handy quick release system which makes the connection and removal of the camera a "snap." Differing itself from many inexpensive ball heads on the market, the base of this head can rotate (pan) in addition to the ball movement. This makes horizontal movement of the camera much faster and easier. Box Dimensions (LxWxH) 6.1 x 3.5 x 1.7"
SBH-100 DQ Compact Ballhead 100 with Quick Release is rated 4.5 out of 5 by 22. Rated 4 out of 5 by PaulW from Small, light, and it works This little ballhead works well for my P&S and micro four thirds cameras. It's small, light, and appears quite strong for its size. It works nicely on my small travel tripod. A couple of downsides though; although it does have a panning base, there is only one knob, so you're actually loosening the ballhead to pan. Also, the panning action is not smooth; there is a rough feel to it, almost like a bad bearing, but for the price, it works for me. Rated 5 out of 5 by Anonymous from Nice package Bought this head for my Bogen monopod for light travel with a medium digital camera. This was the smallest and lightest one I could find with a quick disconect plate. Nicely made with a nice release and hold feature for the plate I have not seen on other heads. Also, adjustment screws are held in place so they cannot be lost. Rated 5 out of 5 by Jocko463 from Nice upgrade .... ...for your older model Slik Sprint Mini tripod....or any small tripod lacking a quick disconnect. This is an easy way to upgrade your Mini with a quick release ballhead. I have one of these tripods and it's great; it's only drawback is that it did not have a quick disconnect ...with the SBH-100 the problem is solved. I use this with my Nikon D40 and stock lens (and matching 55-200mm tele) with no problems. It works well and the quick disconnect is a great. The retaining shoe is low profile and light and leaving it on the bottom of the camera is no problem. Are there better mini ballheads out there? Sure, if you feel the need to drop heavy coinage for something else more esoteric go for it. But in the bang-for-your-buck rating, this Slik is hard to beat. Rated 4 out of 5 by Soli Deo Gloria Photography from Not bad I got this to attach my Yongnuo speed light to a boom stand. It simply screwed onto the 1/4 inch threads on the stand. I then screwed the quick-release base onto my speedlight foot and snapped it into place. It worked exactly as I needed it to. While I feel it is pretty secure, the clamp doesn't tighten as much as I would like, and after a lot of use it may be too loose to function someday. But for the price, I'll just get another one when that time comes. It works for now. Rated 3 out of 5 by sambucadog from so-so I wasn't crazy about this ballhead. My NEX7 with 55-210 lens had a lot of play, the weight of the lens (which is fairly light) was a bit much for it. No problem with a return at B&H though. I wound up getting the Sirui T-005 with Arca type ball head an it's great, although I had to spend more to get an Arca plate for the camera. Worth it though. The motion of the head on the Sirui is also much smoother than the Slik. Rated 5 out of 5 by Sparky from Great Product I have used the round ball head for years and I wouldn't use anything else. I was throughly pleased with the compact design. Now Slik has added the Quick Release and made this product even more appealing. I now can have a quick release for my Swarovski EL Binoculars and another one for my Swarovski Spotting Scope. What a great product. Kudos to whoever thought this application up. Rated 5 out of 5 by KenSea from Fit My Kit I researched monopod heads and had a couple in mind when I went to B&H. From the information I gathered, examining the units on display and talking with a store representaive. I purchased the SBH-100 DQ. It is an excellent fit for the purpose I had in mind. It has operated and performed exactly the way I wanted. Rated 5 out of 5 by twokatmew from Good ball head I put these ball heads on my table-top tripod and my monopod. It holds my Kx (with a variety of lenses) securely. This ball head uses the same quick release as the SBH-120, which I use on my full-size tripod. As I result, I can leave the quick release plate on my camera all the time. Could I use Ballhead with Quick Release on it ? Does it fit Slik U9000 ? Could I use a Ballhead with Quick Release on it ? Hi, Does the screw of the Quick Release plate need a separate twisting tool or a coin to attach the camera or the Quick Release has a inbuilt twisting knob? The plate screws on to the camera. You will need a coin or screwdriver to remove it.